Drakenstein Stud’s well performed young stallion Gold Standard received a handsome boost to his already impressive pedigree this weekend. His talented half-sister Gottalottaluv made it back to back wins when romping home to victory in the Allez France Stakes at Turffontein on Saturday. A four-year-old daughter of Var, the Stuart Pettigrew trained filly powered clear to register a 3.4 length victory in Saturday’s R135 000 contest for fillies and mares under recent G1 winning jockey Diego De Gouveia. Bred by Carl and Amanda De Vos, the well related Gottalottaluv, whose dam Olympic Dam is a daughter of champions Model Man and Olympic Duel, has now won or placed in 11 of 15 outings, with Saturday’s Allez France win taking her earnings to R368 875. Her top class half-brother Gold Standard recently completed a successful first season at Drakenstein Stud, where his book included a number of well connected and performed mares –not least of which was former Equus Champion Lady Windermere. 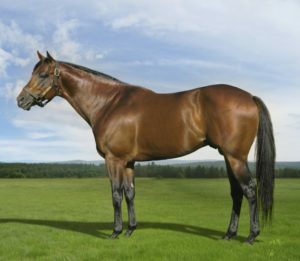 A son of Drakenstein Stud’s champion sire Trippi, Gold Standard was one of the best horses of his generation with his wins including the 2016 G2 Selangor Cup. That race saw the handsome bay account for the likes of Equus Champion Edict Of Nantes, G1 winning sire William Longsword, and the graded stakes winners Table Bay and Our Mate Art. Also victorious in the Listed Racing Association Stakes, Gold Standard, who also ran a half-length second to William Longsword in the 2016 G1 Grand Parade Cape Guineas, accounted for some of the best horses of his generation. Edict Of Nantes and William Longsword aside, Gold Standard’s beaten rivals included the G1 winners Heavenly Blue, Gunner, Marinaresco, French Navy, Bela-Bela and The Conglomerate –as well as subsequent high class Hong Kong galloper Singapore Sling.